We 6 of us from our office headed by our Personnel Manager Mr.Joseph, made our trip to Aringnar Anna Government Arts College situated in Karaikal. Why? - For conducting a walk in interview to add up the strength of the workforce of our manufacturing facility in Pondicherry. The trip - Its a 4 hour drive for our group to catch up the place of interview. Heading on to the hall where the interview is fixed. 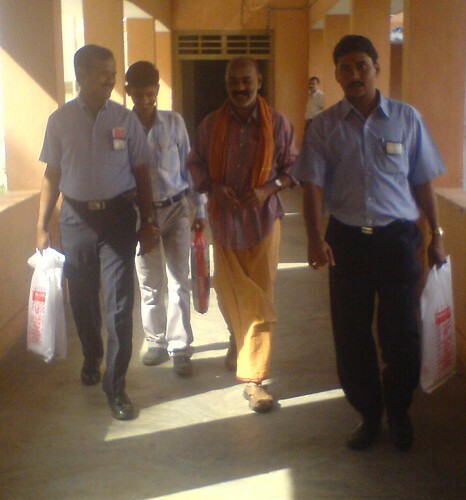 In the photo is Subramani, Manikandan and Kannan. Along with them is Mr.Selvaraj working as Professor in this college, his wife is working in our company as welfare officer. The interview started exactly at 10.00 am as per the schedule. With Kannan at the registration desk, candidates are seen making the beeline for the interview. Nearly 80 people turned up for the interview, of which 40 were qualified for the examination. The process has started, Subramanian is recording the height of one of the candidates. Candidates who are below 50Kg weight and below 5'5" are rejected. Our Personnel Manager, giving out the a talk for the press. Examination for the short listed candidates have started. One of the candidates getting his doubts clarified with our Personnel Manager. Totally 40 aspiring candidates took part in the examination. Candidates busy with answering the questions. One of the candidates clarifying with Subramanian as Kannan looks on. 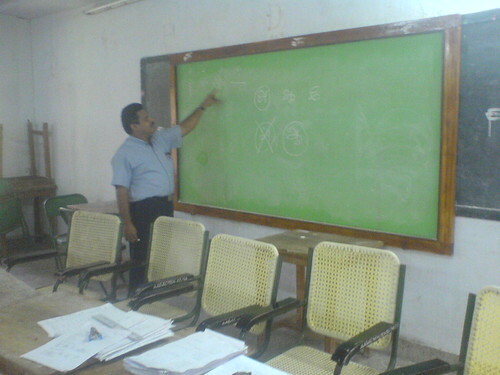 Gopal sir, our training coordinator seen clarifying the candidates with pictorial representation. Answer sheets received from the candidates after the exam. This is the tool for picking out the qualified candidate from the crowd. Yes, the part of the workmen selection process is over and we left the college campus after this group photo at around 2.45 p.m. 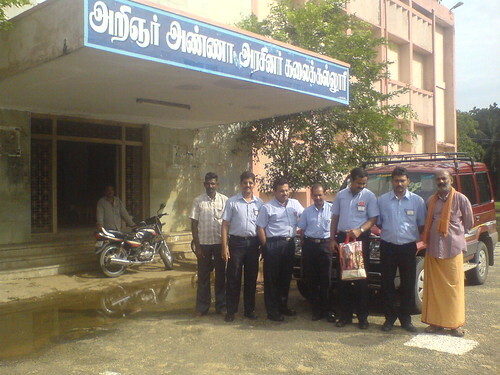 Photograph taken by Manikandan so he is seen missing in the photo. Professor Sir is very much helpful in making sure the arrangements are to the best. Thank you very much to Professor Sir and the management of Aringnar Anna Arts college in taking efforts and making arrangements for conducting the walk in interview smoothly.